Shari Rigby (October Baby, Overcomer) spoke to the New York Media Initiative on January 24 when she was in town for a screening of her newest film, The Least of These: The Graham Staines Story. Joyce and I saw a screener of the film and really loved it! Our friend and colleague, Bev Holloway (Beyond the Mask, I Can Only Imagine, Mom's Night Out) was the casting director, and she put together a great family. Shari plays Gladys Staines opposite Stephen Baldwin (105 credits on IMDb). 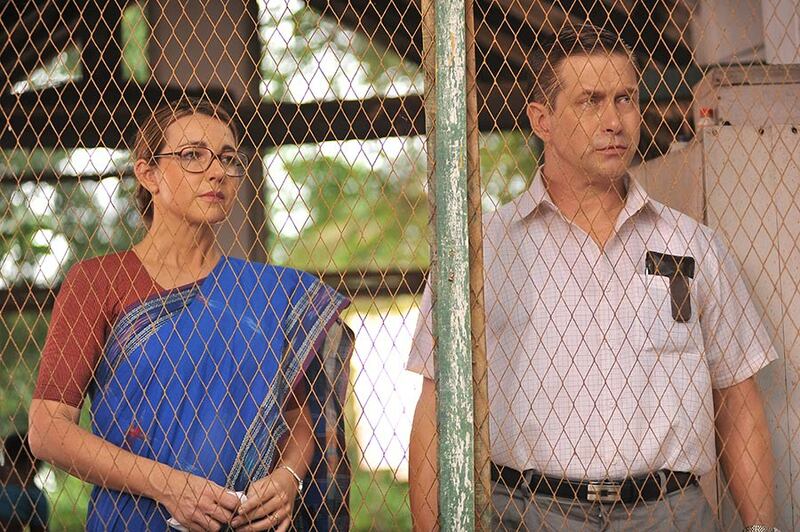 Both do a brilliant job of bringing this couple to life and showing their peace in the presence of persecution. The screenwriter has framed the atrocity at the heart of the film in a very intriguing way. We see it unfold through the eyes of a journalist who is trying to find evidence that supports his viewpoint. So it feels relevant in an era of fake news. This important story is being told in theaters February 1 with a special showing January 31. Find a theater near you: www.TheLeastOfThese.movie. Shari's talk for NYMI was outstanding! She shared some personal trials she and her family have gone through, and she said as Christians we shouldn't cringe when we face battles because it's an opportunity to take ground for the Lord. She said we are created and called to take ground for the Kingdom of God, and Jesus the Warrior is by our side when we walk in obedience. She shared that in the midst of her family's trials she heard a sermon on Joshua leading the Israelites to circle the city of Jericho six times, and on the seventh they blew their trumpets and the walls came down. I've personally seen those crumbled walls, and archeologists have found the corner where Rahab's home was kept secure. But that day Shari didn't want to hear another sermon on Joshua. The Lord urged her not to just look at the march and the fall, but to look at what led up to it. She remembered Joshua's obedience to speak an honest report about the Promised Land in the face of the majority of the spies who were cowards. He was obedient to take over when Moses died. He was obedient to lead the way across the stopped-up Jordan River. And when the Lord appeared to him in human form (one of many evidences of the Trinity), Joshua worshipped Him. It was Joshua's life of obedience that paved the way for the miraculous wall fall. Shari's obedience was to go back to her beginnings. She charted a map of all the connections that got her where she is today, starting back to her childhood. When she looked at the map it was so clear to her that the Lord had a hand in it all! She urged us not to get wrapped up in doing projects that make us famous. Every December she prays for stories to tell in the coming year that will make Jesus Christ famous. When we operate in obedience to his call on our lives the walls will fall, and He will get the glory. Pray that many see The Least of These and that the Lord will get the glory! Parents may want to visit the Dove Review for more details. I watched the Fathom Event on January 31, and I was moved all over again! It was followed by an interview with Shari and world-renowned apologist, Ravi Zacharias. Shari talked about working in the presence of real lepers in one of the actual Leper Homes the Staines had run. She said that when one of them raised her foot for Shari to work on it the smell of death was in the room. She ran off camera to her husband, who encouraged her. They prayed, and when she went back to the set she smelled a fragrant aroma she knew was the Holy Spirit. Others on set commented on it, too. Shari loved working with the three Australian children, who were actually siblings in real life! She was grateful that they were helping her with her accent! When the interviewer, Krish Dhanam, asked Shari what she would say if Gladys Staines was in the room, Shari broke down weeping. She said she would thank Gladys for such a profound act of forgiveness. Ravi thanked the filmmakers for shining the light on the good that Christians are doing in India, and have been doing for hundreds of years. He said that the story of forgiveness is a picture of what Christ did. All forgiveness requires sacrifice, and we saw that so profoundly through this story, but Jesus Christ forgave all of humanity. What a price! What a reward! All who call on Him will be saved. I got to perform in For the Glory and The Screenwriters with Jason Burkey, who performed in October Baby with Shari. The photo shows us in our 1940's duds covered up for a meal on the set of The Screenwriters.